During the winter, outdoor cats sometimes sleep under the hoods of cars to keep warm. When the motor is started, the cat can be injured or killed by the fan belt. If there are outdoor cats in your area, bang loudly on the car hood before starting the engine to give the cat a chance to escape. Never let your dog off the leash on snow or ice, especially during a snowstorm. Dogs can lose their scent and easily become lost. More dogs are lost during the winter than during any other season, so make sure yours always wears ID tags. Thoroughly wipe off your dog's legs and stomach when he comes in out of the sleet, snow or ice. It is also important to check his paws after he has been outdoors. He can ingest salt, antifreeze or other potentially dangerous chemicals while licking his paws, and his paw pads may also bleed from snow or encrusted ice. Never shave your dog down to the skin in winter, as a longer coat will provide more warmth. When you bathe your dog in the colder months, be sure to completely dry him before taking him out for a walk. Consider getting your short-coated dog a coat or sweater. 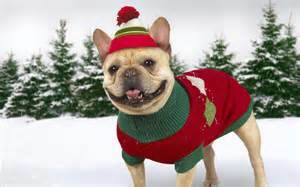 For many dogs, a sweater with a high collar or turtleneck with coverage from the base of the tail to the belly is regulation winter wear. Puppies do not tolerate the cold as well as adult dogs, and may be difficult to housebreak during the winter. If your dog is sensitive to the cold due to age, illness or breed type, take him outdoors only to relieve himself. If your dog spends a lot of time engaged in outdoor activities, increase his supply of food, particularly protein, to keep him and his fur in optimal shape. 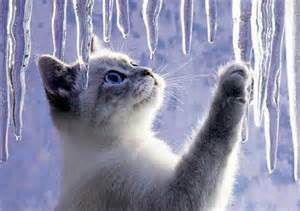 Antifreeze is a lethal poison for dogs and cats. Be sure to thoroughly clean up any spills from your vehicle, and consider using products that contain propylene glycol rather than ethylene glycol. Visit the ASPCA Animal Poison Control Center more information.